Producing some of the most delicious and nutritious nuts, pecan trees can be found far and wide across the southern states of the US–many of which are grown in the beautiful state of Georgia. Typically, a fully mature pecan tree can reach about 150 feet tall, providing ample shade during those hot southern days. However, taking care of these massive bareroot pecan trees takes an abundance of tender, love, and care. If you are looking for a retail pecan nursery to purchase bareroot pecan trees, contact Georgia Pecan Nursery, today! We have pecan trees for sale and our trees range from 2 foot to 10 foot and are available as bareroot and container grown. Water is essential: Consistent watering is highly important for the viability of a newly planted bareroot pecan trees. Although rain will help you keep your pecan trees nice and watered, in the event of sunny skies, be sure to water your tree on a weekly basis. When you water, you want to ensure that the soil surrounding your tree is evenly moist. Always use fertilizer: The first thing that new planters want to do is spread fertilizer around the base of their pecan plant to help increase the growing process. However, many experienced pecan farmers suggest that you wait to use fertilizer until a year after it’s first planted. It’s recommended that you use a pound of 5-10-15 fertilizer and spread it around the tree. Many pecan tree farmers suggest that after two or three years, it’s ideal to switch your fertilizer to a 10-10-10 version. For optimal results, use the fertilizer later in the winter or during the early spring, repeat again towards the end of the spring season. Pay close attention to when your tree starts to produce nuts, for once this occurs, you’ll want to use at least 4 pounds of 10-10-10 fertilizer to cover the full diameter of the trunk. Zinc: Surprisingly, zinc is an essential element in the growth of fruitful bareroot pecan trees. 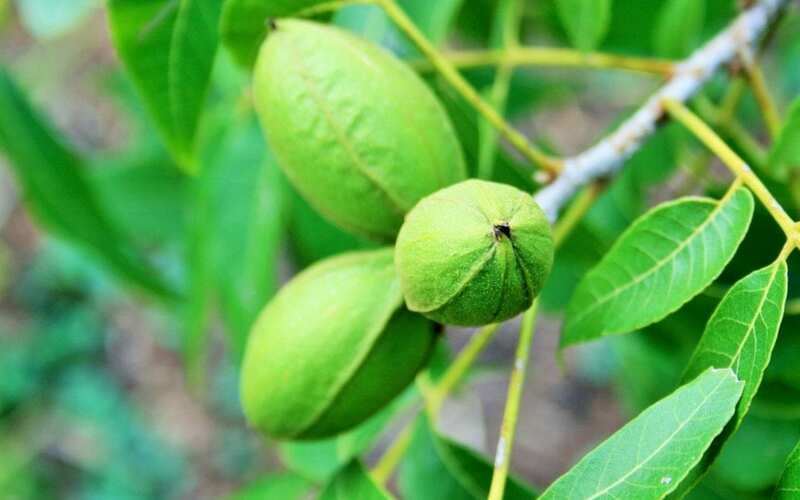 During the young stages of your pecan tree, it’s recommended that you use around one pound of zinc sulfate and then increase it to three pounds once the tree starts to produce nuts. Harvesting your pecans: When they are ready to harvest, pecans will naturally fall to the ground. However, you can also knock them down using a pole or even shaking the branched a bit. If you do let your pecans fall to the ground on their own, be sure to pick them up immediately. Many times, if they are left there too long, bugs, birds, and other animals can get to them first. Once you have grown your bareroot pecan tree to full-size and collected your pecans, you can start harvesting! Remove the hulls, dry them out, and use them for a variety of delicious dinners and decadent desserts! For more information on pecan tree sales and bareroot pecan trees, contact Georgia Pecan Nursery, today!